Back row: Henry , Gibson, Churchward, Gray, Endersby, Wollen, Hughes. Middle row: Gregg (asst. 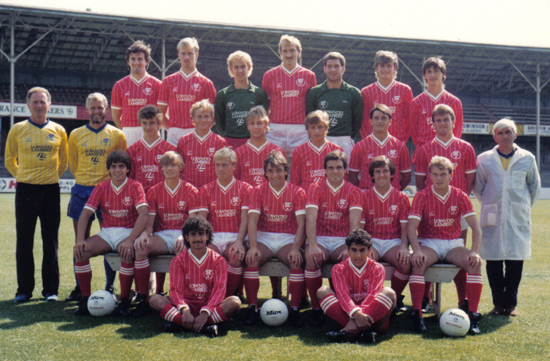 manager), Trollope (youth team mgr), Reynolds, Gardiner, Davison, Prowse, Graham, Hockaday, Morris (physio). Front row: Batty, Nelson, Barnard, Macari (manager), Rowland, Mayes, Bailie.